Among Kinsale's many delights, chosen by Rick Steves as 'Kinsale's single best attraction'. 90 minutes of fascination and fun. Suits all ages; Barry surfs. Don hates hills. Pay at the end. 8euro Adult, 1euro Children or Drop out for FREE if not delighted. 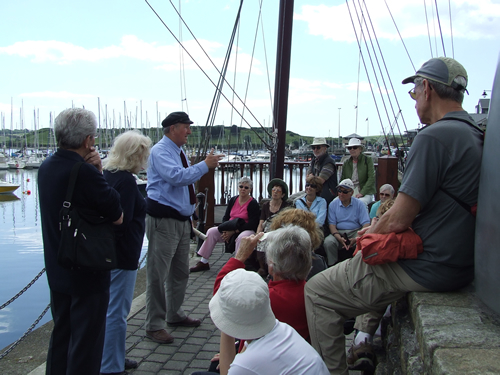 'The original daily historical walking tour of Kinsale - Now celebrating over 25 years! Stroll and sit with Don Herlihy and Barry Moloney to enjoy a colourful story of Kinsale down the ages from Medieval walled town to the sinking of the Lusitania. Strategic naval base during the conflict for New World treasure when a pound of cloves fetched two head of cattle and the island of Manhattan was once swapped for a tiny one of nutmeg!